Mine: Great action film. Top notch villian. Great setting. Very well done. Made Bruce a star and you can see why. Lots of fun. 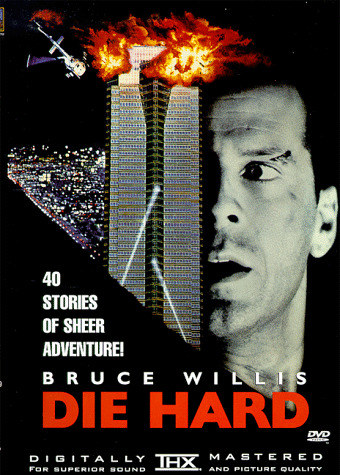 Leonard Maltin/Plot synopsis: Dynamite action yarn about a N. Y. C. cop who just happens to be visiting an L. A. highrise when it's commandeered by terrorist thieves. Great action scenes and stunts, with Richard Edlund's special effects, and a perfect part for Willis, who plays cat-and-mouse with bad guy Rickman. Marred only by overlength and too many needlessly stupid supporting characters. Followed by two sequels. Panavision.